This is a two-story, three-bay wide house, three bays deep, in the Classical Revival style. It was constructed of steel reinforced concrete and clad with two-toned brick in a plain or headerless bond with brown mortar. Yellow brick has been used for quoining and trim. Window sills are of cast stone. It has a flat roof with modillions on the wide overhanging eaves and a dentil band below. The front facade is symmetrically organized and dominated by a two-story entrance pavilion with arched openings, having faux brick keystones, on the front and sides of the first floor. The side openings are glazed with 12 lights each. Its second floor is a sun porch with rectangular openings. On the right side is a one-story entry vestibule, also with a flat roof with rough-faced stones up to the side door. The left side has a two-story canted bay window along with an exposed brick side wall chimney with quoining just in front of it. The windows appear to be intact: 1-o-1 double hung sashes. The foundation is concrete. A detached one-stall garage that matches the house in materials and architectural details is located to the right and rear of the house. However, the mortar color is a standard grey and an overhead door has been installed. The house is intact with the only noticeable change being the addition of a wood deck in the rear. This house is first depicted on the 1939 Sanborn Map. 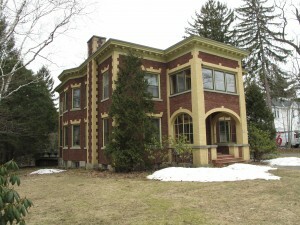 The 1911 Sanborn illustrates a house with a different footprint, which indicates the current house must have replaced it. Mr. Joseph Clifford built this house for his two sisters and a brother: Florence, Annie, and Albert. Their nieces, Beatrice and Coralie Clifford lived in the house from 1950 until 1979. The house left the Clifford family in 1979 when it was sold to Mr. Mathew Merritt, Jr. Mr. Merritt sold the house to Sharon R. Simons. In 1985 Mr. and Mrs. Alan Robertson bought the home. In 1993 the property was owned by Brock Wilkerson. Christine Parke Wilkerson acquired the property in 2005. Mr. Matthew J. Merritt Jr.